The side door was rusted out, or else some fool had painted it the color of dried blood. Overhead, a little blue light winked from inside a steel-mesh cage. I stepped inside, found myself in a two-man bracket: one average-looking, the other sumo-sized. The average-looking guy held out his hand, said "Ten." I forked it over. The joint was long and narrow, with a small raised stage at the far end. And crammed so full of people the owner must have bribed the Fire Department. More black than white, but more mixed than most blues clubs. Places I'd been, the high-end spots had mostly all-white audiences, and the juke joints were almost all black. Maybe Chicago was different. Clancy appeared out of the mob. "Come on," was all he said. I followed him to a table right near the front but so far to the right that it was almost against the wall. A woman with cornrowed hair surrounding a hard face was sitting there. When she saw Clancy, she flashed a killer smile, showing off a gold tooth. She stood up, gave Clancy a kiss. He introduced us, calling me Rogers. Her name was Zeffa. "Son'll be on in a minute," she said to us both. "Should have been on already, but the first set ran long." We took seats. I was thinking … Son? … but didn't get my hopes up. I looked around for the woman in the red dress. There's always a woman in a red dress in joints like this. I wanted to be sure I wasn't sitting too close to her. The drummer suddenly cracked out a back-beat, hammering the talk-buzz into silence. The guy working a stand-up electric bass added a line, the harp man cranked off a few sharp notes, and the rhythm guitarist carried the lead for a minute, building. An unmanned black guitar rested against the front-most microphone stand. A slim man strode out on the little stage. He was all in black, including a cowboy hat with a heavy silver medallion just over the brim. His coat was so long it was almost a duster. He reached down, picked up the black guitar … and the crowd went berserk. He smiled gently, a handsome man with strong cheekbones and a beard, bowed his head a few inches in acknowledgment. Most bluesmen open with an up-tempo number, get the crowd into the action. But he started with "Bad Blood," a true-tale ballad that pile-drivered its way down to where you lived, if you'd ever lived at all. His long fingers were flint against the steel strings, drawing fire … and painting pictures with it. I don't know how he did it. I can't imagine he'd be able to put it into words if anyone asked. The crowd was insane … and under control. His control. He was dealing for real, and the crowd was in his hands—spontaneous reaction to spontaneous combustion. As he teased an impossible run of unreal notes out of the steel slide, a thickbodied man in a yellow silk shirt stood up and yelled out, "That's the real thing, brother!" as if he were waiting on a challenge. You could almost see the notes flow out of that black guitar—a liquid ribbon of honey and cream, draped over concrete and barbed wire. For a slice of time, I was transported. Lost in the truth. Feeling … connected to something more than me and mine. I reached for a cigarette. Came up empty. Zeffa was next to me, on my left. Her hand dropped to her purse. She flicked it open one-handed, pointed to a pack of Carltons. The pack was right next to what else she was packing—a dull-black Glock. I thanked her with a nod. Lit the smoke. Took a deep drag. It tasted like crap, no hit at all. I put it in the ashtray and let it burn down. The man with the black guitar finished his set … barely. The crowd kept demanding "One more!" and he kept going with it. Finally, he just bowed slightly, touched the brim of his hat, and stepped off the stage and out the back. 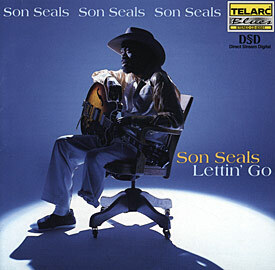 "Son Seals!" the announcer shouted, as the man walked off with his black guitar. We followed her to a basement where ratty old couches were stacked against one wall. Son was seated, alone, smoking a slim black cigar. Zeffa introduced us. I didn't know what to say, so I just said the truth. "You're the ace," I told him. "Thank you," was all he said. Not grabbing the title, but not disclaiming it, either. 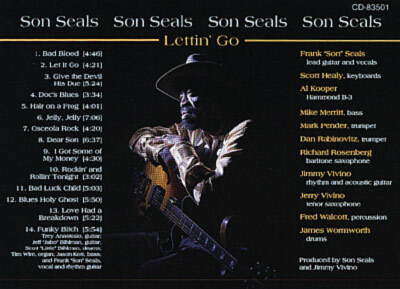 Lettin' Go from Son Seals features two tracks co-written by Son Seals and Andrew Vachss. The packaging includes a short story by Vachss, and an edited excerpt from the author's novel, Dead and Gone (Knopf, 2000). "Son Seals, Dues-Paying Bluesman Perseveres"
"A Walk on the Wild Side With Chicago's Toughest Bluesman"